Just because temps get low doesn’t mean your drinking shouldn’t stay high-in-the-sky—these cooler-weather cities offer rooftop perches that are welcoming and warming, all winter long. Forget summer's balmy breezes and frosty pitchers of frosé—for now. 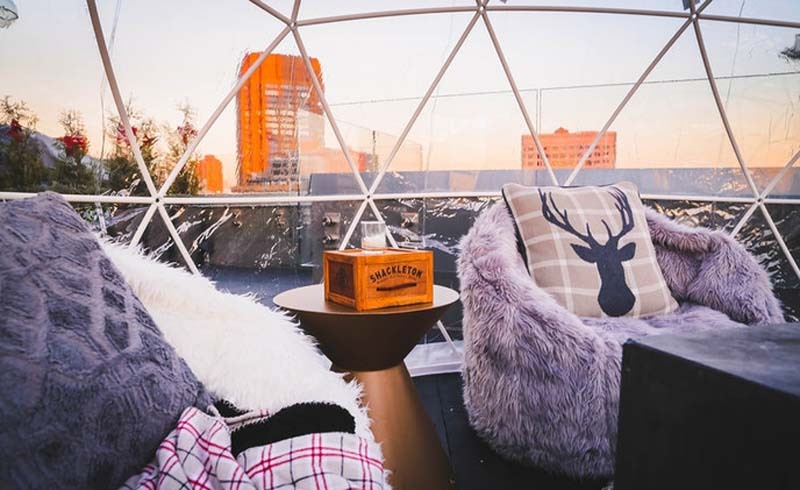 From Nashville to New York City (and beyond), these hotel rooftops across the U.S. are heating things up this winter with features like cozy igloo-style seating areas, cold-weather games, crackling fire pits, and warming dishes and drinks. The Bobby Hotel's Rooftop Lounge debuted complimentary games of curling this winter season. Opened in downtown Nashville in April 2018, Bobby Hotel is a happening hangout in Music City thanks to its lively Rooftop Lounge. 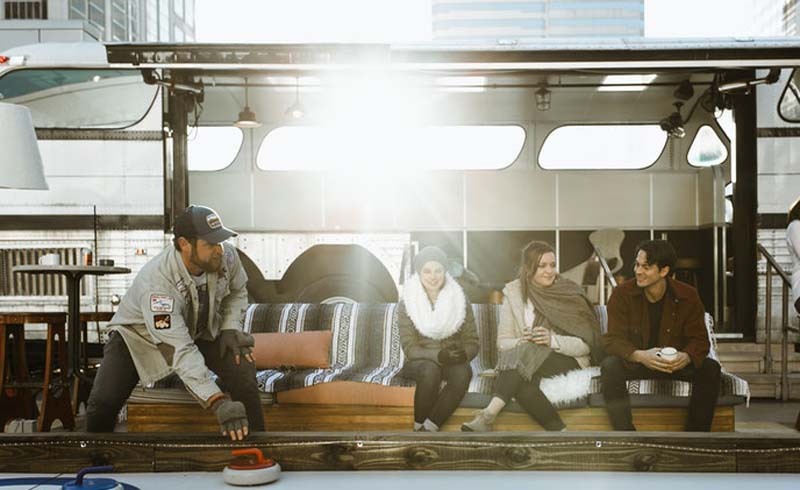 Open all winter, the ninth-story space features views of downtown; a 1956 Greyhound Scenicruiser bus turned bar; cozy fire pits; wood-plank seating draped with warm blankets; and heated, see-through "igloos" that are strung with twinkle lights and seat up to 10 guests. (The igloos are available on a first-come, first-served basis, or with a reservation that requires a $400 food-and-drink minimum Sunday through Wednesday, and $750 Thursday through Saturday.) After trying your hand at a complimentary game of curling on one of the lounge's two new ice lanes, thaw out with warm mulled wine or a specialty hot cocktail like the Boozy Hot Chocolate, Yule Tide Toddy, or Spiked Apple Cider. 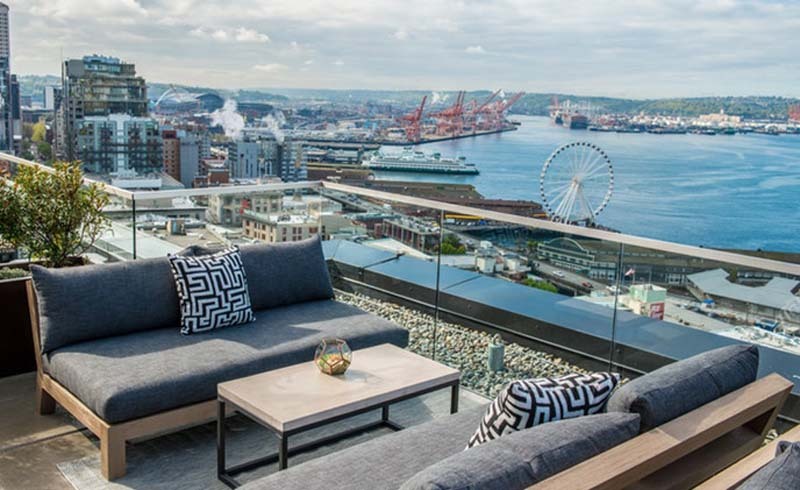 Thompson Seattle's 12th-floor rooftop bar and terrace grants views out over Elliott Bay and the snowcapped Olympic Mountains. Throughout winter, The Nest—the Thompson Seattle's 12th-floor rooftop bar and terrace—is enclosed in a transparent, heated tent and is decked out with twinkling lights and blankets, giving visitors to the downtown hotel a fun and festive place to enjoy views of Elliott Bay and the snowcapped Olympic Mountains. If the bay breeze is more than you can bear, head inside, where plush velvet sofas await. Hot drinks from The Nest’s new winter menu include Like Nana Made It (apple brandy, apple cider, amaretto, allspice dram, and Jerry Thomas Bitters) and Tea & Biscuits (Earl Grey tea, Glenmorangie 10-year-old Scotch whisky, ginger, Tuaca, and sweet cream), plus house-made sodas and mocktails. Take in Chicago's skyline from heated igloos atop The Godfrey Hotel. Teeth-chattering temps might keep some Windy City residents holed up indoors until spring, but with its fourth-floor rooftop lounge, I|O Godfrey at The Godfrey Hotel (in the city's River North neighborhood) is inviting visitors to come up and embrace winter's chill. 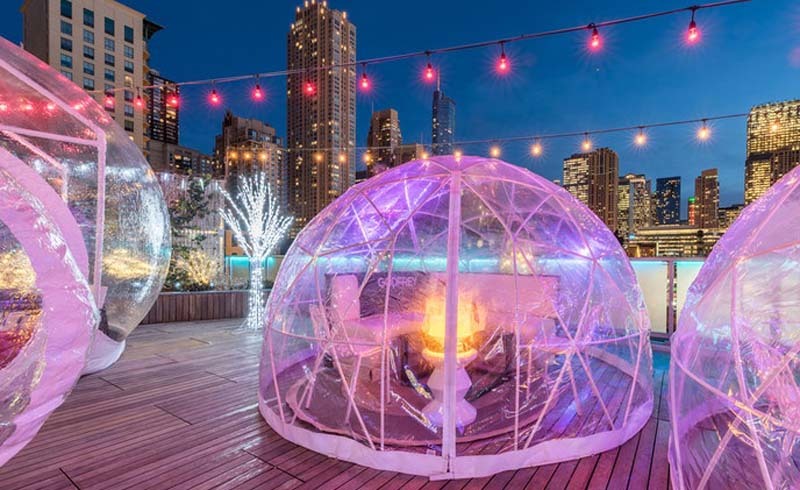 With iconic Chicago buildings such as Willis Tower and Marina Towers within view, patrons can bundle up in robes and blankets and enjoy table service in individually heated igloos (the transparent structures are available by reservation only for groups of two to 10; bottle service starts at $275). Fire pits are open to all guests, who can gather around to prepare s'mores using house-made marshmallows and to sip seasonal cocktails, like the Snowflake Sangria (its ice cubes are flavored with natural fruit purée and floral extracts) or a hot Godfrey Toddy, served in a bubbling siphon coffeemaker. As if the setting wasn't dreamy enough, new-for-this-season snow machines are turned on during busy periods to help create a winter wonderland feel with faux snow. 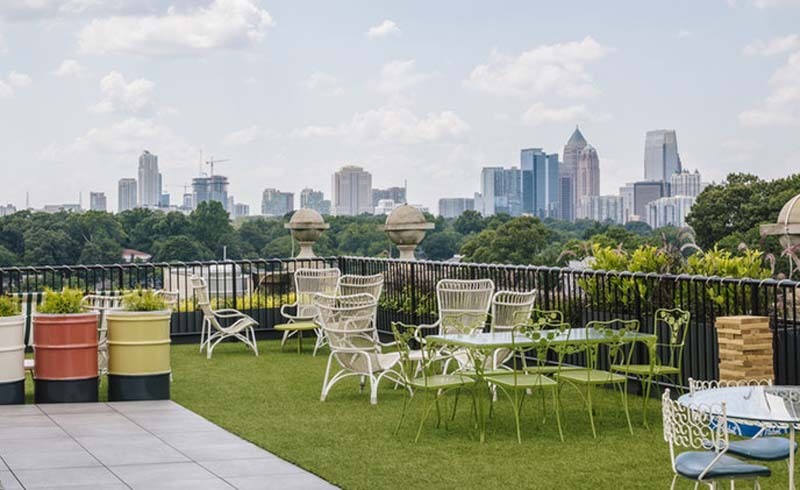 At the Hotel Clermont in Atlanta, a rooftop terrace offers a prime perch for cityscape views all winter long. Atlantans love many things about their city: its parks, international restaurants, sports teams, and perhaps most of all, its striking skyline. Happily, one of the city's most buzzed-about new hotels is also home to a sixth-floor rooftop terrace where guests can take in the cityscape all winter long. 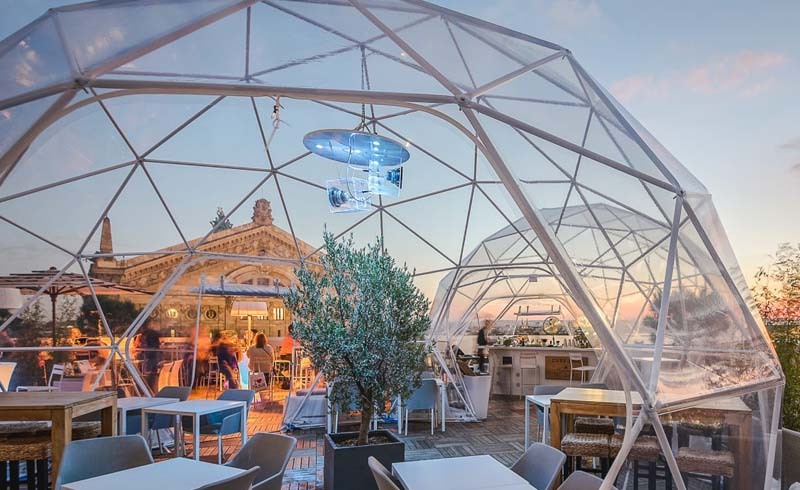 The popular rooftop bar at Hotel Clermont, which opened in June 2018, is warmed with a tent and extra heaters, creating a toasty, wintertime vibe for chillier nights. While you're up there, sip craft cocktails, draft beer, and seasonal hot drinks such as hot toddies and mulled wine. Don't forget to snap a picture of the city's hip Poncey-Highland neighborhood, the Midtown skyline, and the hotel's iconic and newly restored radio tower, before heading back into the tent or downstairs for a bite at the Clermont's buzzy restaurant, Tiny Lou's. Be transported to Antarctica via the sky-high pop-up at Manhattan's Arlo NoMad. Antarctica might be the ultimate place for a winter adventure, but you don't have to trek to the ends of the earth to experience a taste of it. Instead, head to Arlo NoMad (in Manhattan's NoMad neighborhood) where the second-floor terrace, BARlo, and rooftop space, The Heights, have together been transformed into "Arlo Arctica," an Antarctic-themed pop-up that's inspired by Sir Ernest Shackleton's legendary early-1900s expedition to the South Pole. Now through March, the BARlo terrace features indoor ice sculptures, Shackleton artifacts, a fireplace, camp-style furnishings, and cozy blankets. A custom Arlo Arctica menu highlights Antarctic-themed dishes like the South Pole Pizza (béchamel sauce, onions, fontina, and pancetta), as well as special Shackleton Whisky cocktails like 88 Degrees South (lemon, lime, angostura bitters) and Royds Toddy (Earl Grey tea, lemon, cloves). 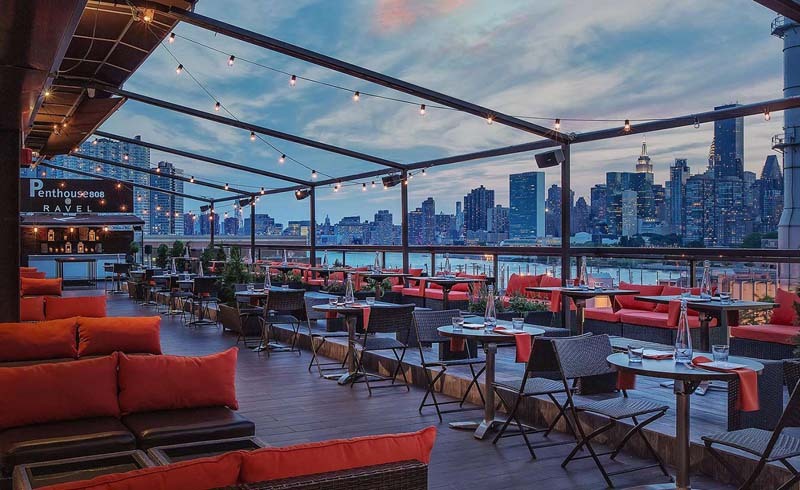 At The Heights, the hotel's 31st-floor rooftop space overlooking the Empire State Building and the East River, guests can enjoy cocktails, bites, and bottle service inside one of two ice huts (reservations are required, and a $300 food-and-drink minimum applies). It's the perfect setting for a toast to the ultimate Antarctic explorer. Halcyon Hotel Cherry Creek's rooftop is the place to be in Denver on Friday nights, complete with robes, a hot tub, firepits, and warming drinks. At Halcyon, a 154-room hotel in Denver's shopping- and dining-centric Cherry Creek neighborhood, city life meets après-ski thanks to its "Robes on the Rooftop" program. 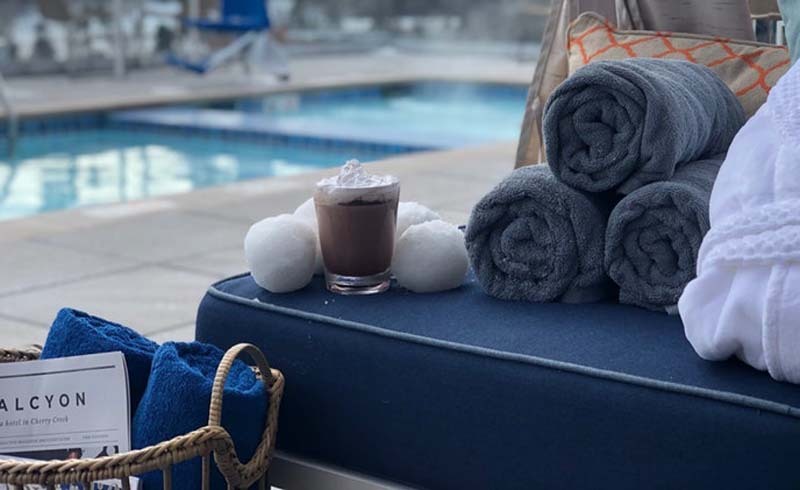 Every Friday this winter from 4 p.m. until 6 p.m., patrons of the hotel's eighth-floor rooftop pool deck can thaw out with a dip in the heated pool and hot tub before wrapping up in a soft robe and cozying up by a fire pit—hot toddy or cocoa in hand and views of the Rockies ahead. Other features designed to heat things up include a hot beverage station, slipper warmers, and plush blankets, too. 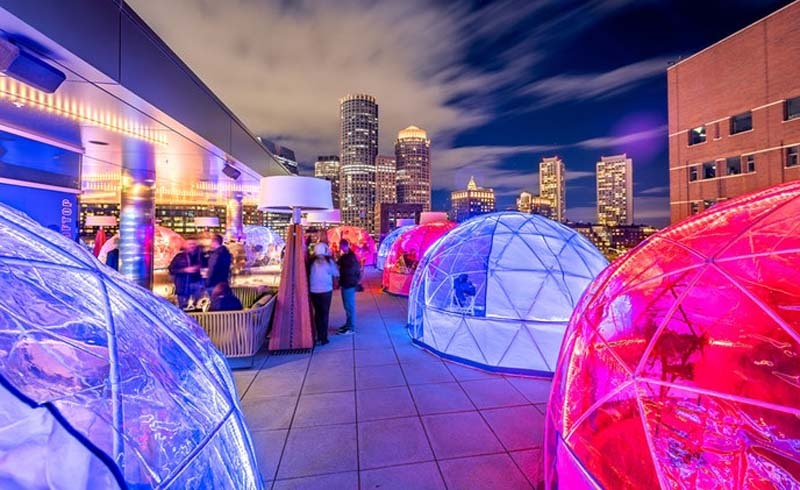 Hunker down for Boston's winter chills in a heated and illuminated igloo atop The Envoy Hotel. Bostonians are no novices when it comes to bitter-cold winters, but The Envoy Hotel, in the city's Seaport District, is helping take the edge off the deep freeze. On the hotel's seventh-floor Lookout Rooftop, guests can peer out at the city's skyline and waterfront from its open seating area or from inside one of six heated and illuminated igloos (reservations are required for the igloos, where a $500 drink minimum and two-hour limit applies). With the simple press of a button, your igloo will light up, letting servers know you need a fill-up. Among the hot drinks on Lookout's cocktail menu are Snuggle Juice (Stolen Rum, Amaro Nonino, cider, caramel) and Teeling Frisky (Teeling Irish Whiskey, white wine, honey, lemon, warm spices). The bar is drinks-only, but head down to the ground floor's Outlook Kitchen to sample Chopped winner Tatiana Rosana's New England-influenced American cuisine.